Extremely popular on Facebook and other social media is the idea that a cure for cancer has been found but is being suppressed. The reason given for the suppression is universally the same. The premise is that companies stand to make more money by treating a chronic disease than from curing it. It’s a simple idea with a simple justification, but the implications are staggeringly complicated. If we consider what the world would have to look like for this conspiracy theory to be true, we immediately see numerous holes and contradictions. It is the nature of human thinking to become upset with behavior we see as unfair. If we are told that the rich and powerful are allowing human suffering to continue for the sake of their wallets, the inclination is to be outraged. Unfortunately, it’s also human nature to justify such feelings once we have them. This causes many to focus on the outrage and forget to think things through and, when presented with the various logical snags inherent to this trope, to rationalize with whatever justifications and compartmental logic is necessary to maintain the outrage. It’s a basic phenomenon we see with virtually all forms of pseudoscience: Start with a conclusion and do whatever it takes to support it. Here we present 10 reasons why the hidden cures narrative is untenable. We urge people to not only consider these points, but to also pay attention to how they are dismissed or explained away by conspiracy mongers. We believe the methods used to counter these points go a long way to explain why the hidden cure trope exists and persists, and that they reveal a flawed thought process rather than any sort of evidential substance. Extraordinary claims require extraordinary evidence, and promoters of the hidden cure conspiracy have no evidence whatsoever: just a narrative. Even worse, the narrative has no internal logical consistency. We have used a cancer cure to illustrate these points, but a hidden cure conspiracy for any disease faces similar criticism. We have also chosen to temporarily put aside the fact that there are many types of cancer, and that different types of cancer would likely require different cures, in order to focus on the implausible logistics that the narrative would require. 1. Not all organizations involved in medical research are for-profit. It is a myth that all research funding comes from organizations with corporate interests. Universities across the world regularly engage in research, and charities such as American Cancer Society regularly contribute funds. Major breakthroughs in cancer treatments have come from such sources, and in principle there is nothing stopping them from finding the “ultimate” breakthrough. This is inconvenient to the conspiracy because without a profit motive the narrative immediately falls apart. It’s like saying that charities dedicated to ending hunger secretly want children to starve just so they have reason to keep the charities active. While it’s true that charitable organizations sometimes become corrupted or were never sincere in the first place, that is usually due to the actions of one or a few people. This conspiracy demands that all people in every organization be perfectly corrupt without fail. 2. Medical researchers and their families are just as susceptible to cancer and other diseases as anyone else. An obvious implication of a “hidden cure” conspiracy is that researchers and business owners are willing to put the company and shareholders ahead of the lives of themselves and their loved ones. It implies that the thousands of individuals involved in research are flawlessly obedient drones never giving in to the temptation to help someone they care for deeply, or to better the world. It means doctors and scientists must be willing to sit and watch their mothers, their daughters, and their spouses suffer and struggle with a disease they know themselves to be curable. It requires a single-minded hive-mentality immune to compassion or grief and a willingness to put a single goal above all personal comfort and well-being. There is no company or government on Earth that’s ever been able to operate in that manner. It would literally require an army of sociopaths that, despite feeling no sympathy for others, are somehow able to come together and mutually agree on a course of action which necessitates self-sacrifice for the sake of their co-conspirators. 3. Even the CEOs of companies won’t be able to utilize their billions if they’re dead from something their companies could have cured. Even if you buy into the idea that powerful people do not care about their friends and families, the very appeal to selfishness made by the greed/profit angle says they care a great deal about themselves. 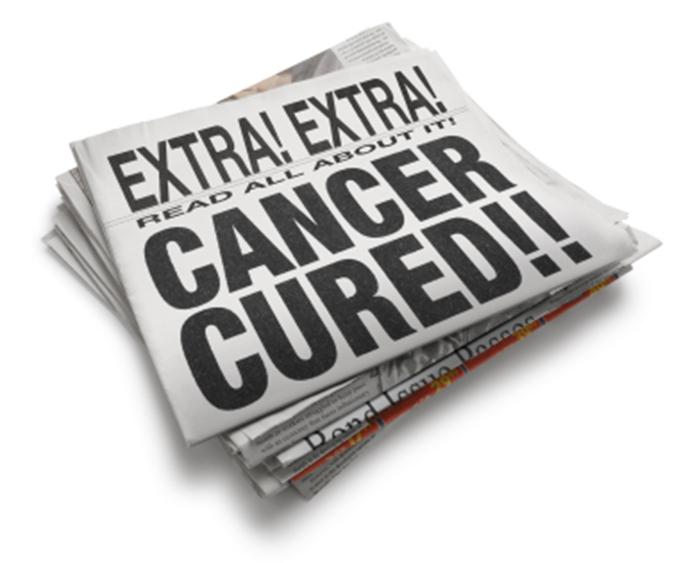 If we were to notice that an overwhelming majority of corporate heads and government officials have managed to escape cancer, then we might have reason to be suspicious that a cure has been found and is being saved for a select few. But that’s not what’s happening. With each passing year the list of rich and powerful people who die from cancer becomes more populated. It includes corporate CEOs, politicians, government leaders, Big Pharma employees, and heads of state from around the world. We would have to believe that these people know of a cure but decide not to use it so as to avoid suspicion. It’s silly to think that any of these people, many who already have fantastic amounts of money, would be willing to face the specter of a slow lingering death just to have a little more. It can’t be true that these people are so selfish as to hide a cure in favor of their own gain, yet so selfless that they are willing to die so the conspiracy can remain secret. These sorts of contradictions arise not from evidence or reasoning, but from making as many assumptions as needed to justify the trope of a hidden cure without contemplating their logical implications in sufficient depth. 4. Many if not most researchers are more likely to value fame, prestige and personal achievement over sheer quantity of money. Even if we tacitly accept that scientists and doctors do not care about making a difference the world or helping sick people, we still can’t assume that the only thing they care about is money. Any scientist who finds or participates in research leading to a breakthrough cure is going to be instantly famous among colleagues and peers. It’s a chance to show all the foes and detractors from your entire life that you are not a loser, that you are in fact the very best at what you do. It not only means a Nobel Prize, it virtually guarantees statues and entire buildings erected in your honor and a mention in virtually every medical and science textbook. It means you can set your salary and work for any company you choose, doing whatever research you like. It means adoration from millions of victims and family members whom you have saved. Finding a cancer cure would mean a reputation to rival that of Einstein’s and a legacy which will persist throughout history. It’s not very easy to believe that any scientist would be willing sweep these benefits under the rug along with the cure, and the more shallow and selfish the conspiracy claims the scientists to be, the more likely it is that they value total personal gain over mere financial gain alone. 5. While all governments would have to be in on it, not all would make money. Many such conspiracy theories rely on cooperation between governments and pharmaceutical companies, yet there are countries with socialized medicine who could dramatically reduce their healthcare costs if they were to expose hidden cures that were being suppressed. Is it likely that they’d be sitting idly by, losing money while everyone else gets rich? Wouldn’t any country like to reduce healthcare costs and instead spend the money on things like defense and energy development? No, we’d have to believe that, in a world where the “hidden cure” conspiracy can be uncovered by anyone with a laptop and WiFi connection, these countries had somehow missed it. 6. Pushback from insurance companies. Again, if any conspiracy theorist with a computer can find evidence of a hidden cure, then insurance companies must also be aware of it. Why would big insurance companies continue paying for expensive yet inefficacious treatments when a cheap and effective cure is available? If hiding the cure brings in the big bucks, then insurance companies are the ones largely responsible for paying the bill. They’d have every incentive imaginable to uncover and expose the suppression of superior and cheap treatments. Why would they be motivated to keep quiet while forking over huge sums of money to something they know to be a fraud? Again, we’d have to believe that they had somehow missed it. 7. Actually, companies WOULD make a lot of money from cures. In what universe would a treatment of such monumental efficacy not be marketable? If it could be patented, then the inventors would go down in history for their achievements (which to many scientists is more valuable than just being ridiculously rich but unrecognized for their accomplishments), and the company they worked for would make billions. Sometimes conspiracy theorists respond to this by claiming that the hidden cures might not be patentable, but that’s not a valid argument either (for two reasons). Firstly, companies can and do make a lot of money from non-patented products and services all the time (including pharmaceutical companies). This may consist of selling generic drugs, which in some countries comprises the majority of drugs legally sold, or over-the-counter natural supplements, which already comprise a $30 billion industry in their own right. Secondly, it’s not unheard of for a company to come up with a spinoff of a natural substance which CAN be patented. In fact, that’s the case with a sizable portion of the medications already out there. Often all that is required is the isolation and purification of the active compound, and perhaps a slight modification of its chemical structure, or the introduction of a particular drug delivery system. 8. Companies are already choosing cure or prevention over profit. There are already examples of inexpensive products which are very effective at eradicating a particular disease despite the fact that letting people get sick and then treating them would yield more profit per patient. However, companies still create them, which would seem to contradict the claim that companies are so ruthless they’d rather people suffer so they can milk a little more money out of them than to market a cure. Why haven’t vaccines and antibiotics been suppressed? Is there not more money to be made from tuberculosis by treating the symptoms instead of administering the cure? Would no one stand to profit if measles were rampant in America instead of rare? Why would companies be so selective about which cures to hide and which to utilize? Again, this only makes sense if you use logic and reasoning not with the aim of finding truth, but with the aim of justifying the trope. Start with the idea that a cure is being hidden and then use whatever assumptions are needed to maintain the narrative, despite confounding details. Also interesting is when these people learn of the HPV vaccine, which is intended to help prevent cancer, they use the same flimsy logic to dismiss it. They tell you not to trust it because it’s just a ploy to make money. In true conspiracy theory fashion, everything becomes evidence of a conspiracy, even when companies are trying to prevent cancer rather than treat it. This is yet more indication that these theorists are motivated only to serve suspicion and conspiracy mongering while having no allegiance to candid investigation or intellectual honesty. 9. There’s more than one for-profit company out there, which means competition. If you assert that a cure would destroy a pharmaceutical company’s profits, then you are also asserting that finding a cure would be a good way for one particular company to beat down all the rest. If all other companies are selling a lifelong regimen which treats symptoms but doesn’t cure, then you only need to set the cost of your cure somewhere just below the cost of that regimen to make tons of money while also devastating your rivals. You then can leverage the prestige that comes with your cure as weight when asking for donations, when seeking investors, when choosing partners and when applying for loans. You can enjoy the millions of dollars in free marketing and promotion which attaches your company name to success. You also have the added benefit of not watching your loved ones die of a curable disease just so you can protect the profits of your shareholders. It isn’t even necessary for a company to find their own cure first. They could still use the conspiracy against itself. If one of them blew the lid off of some alleged secret cure, or exposed a fatal flaw in a treatment developed by a competitor, they would mop up the floor with their competition. They could then market themselves as The Company You Can Trust. Imagine all the nefarious things they could then get away with if the public saw them as being above suspicion. Even if it were true that there is no money in a cure, the conspiracy itself creates an extraordinary opportunity for any one company to rise to the top and then have cover to do whatever other corrupt thing they please. The more greedy and ruthless a company is, the more likely they are to take advantage of this opportunity. It’s silly to think these companies have no problem double-crossing the public, but would never think of double-crossing each other. 10. Hiding the cure would cost more. Game theoretic calculations are a lot more subtle than the overly simplistic worldview that hidden cures conspiracy theorists tend to hold. Each company complicit in the conspiracy would have to weigh the likelihood and consequences of being double-crossed by their competitors and of every single scientist formerly on their payroll against the predicted benefits. As we’ve pointed out, a conspiracy this large would require cooperation from many entities that would actually lose money. In order for the conspiracy to work, each of those entities would need to be incentivized to stay quiet; in other words, they’d have to be paid more than they would lose. That’s every country with socialized healthcare and every insurance company which pays for treatments. Don’t forget that each doctor, researcher and scientist involved in any aspect would need to be paid an amount sufficient to overcome any temptation to squeal. Clinical trials are an integral part of drug discovery. That’s even more information to suppress and more people who need paid off. All of this comes after the billions spent on research and development to find the cure in the first place. Also needed would be a small army of henchmen capable of dispatching with those who will not cooperate, and with a budget sufficient to cover this all up. This army would also be required to monitor independent and rival researchers, and would need to get to them before they stumbled onto the cure themselves, so as to either pay them off or kill them. At that point, the price tag for having the privilege of holding the hidden cure would likely be in the trillions. To any corporation in this position, having a cure to hide would be a burden: not a boon. Strictly speaking, it may be possible to continually amend the hidden cures conspiracy theory with a never ending regress of evidence-free ad hoc assumptions to make the narrative seem to hang together. Indeed, that is a quintessential feature and attraction of most grand scale conspiracy theories. However, the more ad hoc assumptions and the more people who’d have to be involved in order to preserve the narrative, the less likely the story is to actually be possible, so at some point it may be useful to simply apply Ockham’s razor, and concede the monumental implausibility of the hidden cures conspiracy hypothesis. Co-authored by IFHP and The Credible Hulk.